stacey yacula studio: the last days of summer! the last days of summer! long and I just had a chance to finish it last week. What a wonderful illustration! I really love your art. Your images warm my heart every time I see them. Thanks so much for sharing them with us. Stacey, this sweet image just makes my heart smile... big! 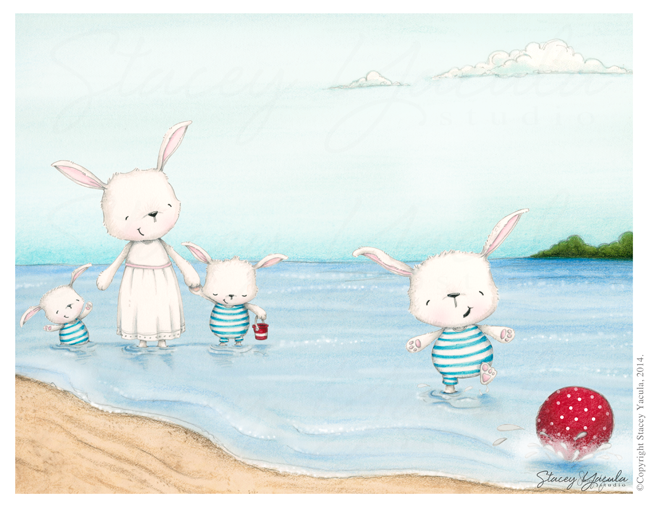 I have a special fondness for bunnies and these are so endearing with their swim suits and sundress. Lovely way to capture such a happy time! thank you sonjak and sally for your wonderful and sweet words about my illustrations. it makes me so happy to know that my art has made your hearts smile. So cute! This reminds me of an old Coney Island beach scene. The vintage 30's swimwear is great. I love your artwork, I've purchased many of your stamps through Purple Onion Designs. They are my favorite "go to" stamps (especially Freckles). If I sent you pics of what I have done with him, you would probably laugh! I think if you partnered with Sizzix framelits and your designs, WOW. By the way, those beach bunnies are adorable, good luck with that. thank you Michele and Jillanne for your sweet and endearing comments about my illustration. Jillanne, I am so glad you are enjoying the stamps and no I wouldn't laugh. The main thing is you are creating and on the journey. enjoy!